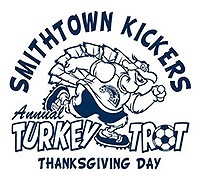 Subject: LongIsland.com - Your Name sent you Event details of "Smithtown Kickers Turkey Trot 2016"
Proceeds benefit Angela's House, Smithtown Children's Foundation, and other local charities! Please bring a can of food for distribution to the local Smithtown Food Bank. After Thanksgiving, the Food Bank needs restocking. So on this day of plenty, let’s help those who need it. Charity begins at home.